This pair of Then & Now photos shows just how poor the state of repair of the cottages in Little Virginia had become by the late 1960s and early 1970s. Given how idyllic these cottages are today and given their prime location adjacent to historic Kenilworth Castle it seems inconceivable that they lay derelict. This uncertainty was set against a backdrop of properties of a similar age being demolished on Clinton Lane, School Lane, Warwick Road and elsewhere during a period of modernisation mania. Robin Leach has kindly provided some context for the struggle to preserve these historic properties: “Little Virginia was owned by the Charles Randall Trust (effectively Charles Randall’s sons; Charles died in 1932 having bought Little Virginia in 1918). The trust did little repair work but the cottages were still occupied and into the late 1960s they were becoming run-down. The trust, trying to offload them, offered them to the Kenilworth Urban District Council (KUDC) but they declined, but soon after the council began re-housing the occupants and started proceedings for compulsory purchase to save them; as that was progressing the trust sold the cottages to Sapcotes”. This period is covered in more detail in Robin’s latest book The Abbey Fields (Rookfield Publications, 2017) . By the time KHAS Newsletter 41 was penned in September 1973 the battle to restore, rather than demolish the properties had been won and KHAS members got the opportunity to dig the site before restoration began. Harry Sunley recorded “We were given permission in April this year to examine the cottages at Little Virginia prior to their extensive renovation. Sapcotes, who are both the owners and builders, have been most helpful, and what might have been a fairly cursory exercise has turned out to be a most interesting project. First of all, the measurers got to work to record the cottages as they were. This included taking a number of photographs. The photography was helped by the removal of the mounds of soil that comprise the gardens, together with the shrubs etcetera, allowing clear views of the cottages. I think the general impression of those taking part was that many of the cottages were in a poor state and that a fairly extensive rebuild was necessary”. KHAS Newsletter 44 in 1975 elaborates on the finds discovered from this dig. The findings are too lengthy to summarise here, and probably warrant an article in their own right. In short, pre-13th Century features were found, walls with possible connections to the Abbey, evidence of usage as a mason’s yard between the 13th and 17th Centuries and evidence of the phases of building on the site resulting in the buildings we see today. Originally this building was two separate dwellings, numbered 9 and 11 Castle Hill. 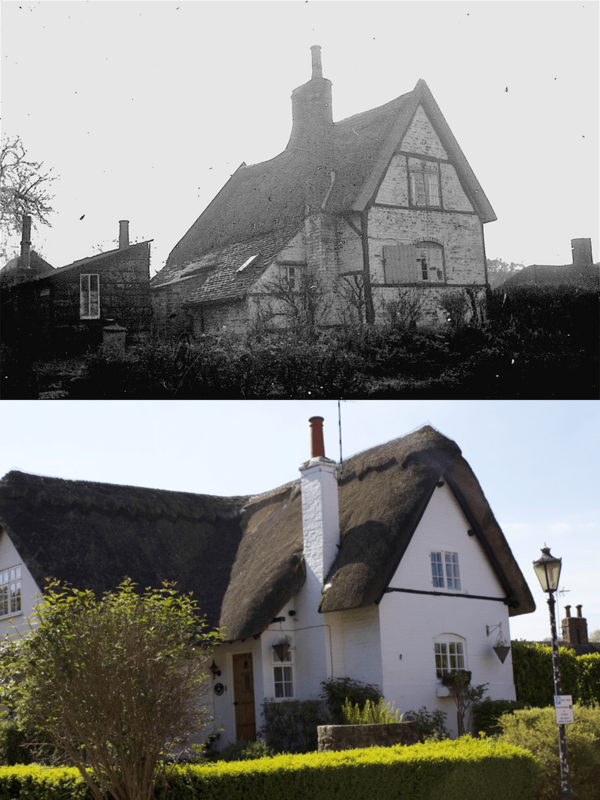 At some point during the renovation and “fairly extensive rebuild” of these properties, the buildings were restored, combined into one dwelling, extended and re-thatched. The property became Grade 2 Listed in November 1970 as number 9, Castle Hill as follows: “C17. Timber frame, colour washed brick nogging. Thatched roof tarpaulin covered. One storey and attic, flush casement windows under cambered relieving arches. Nos 5 to 53 (odd) form a group”.